How’s the Golf Ball Liberation Army doing? Oh, it’s the Tennis Ball Liberation Army now. Uh-huh. Mm-hm. Well, let me know how it turns out. What’s up with me? So far, it’s all good. 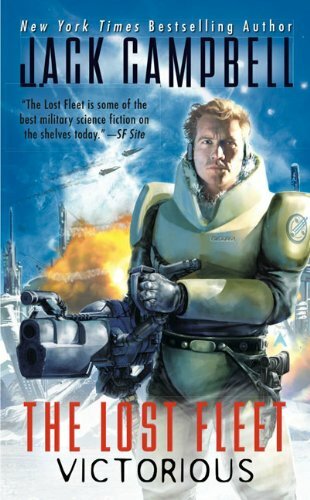 Recently, I read this book called The Lost Fleet: Victorious. It’s the sixth book in a series written by a man whose pen name is Jack Campbell. Uh…he might be interested in freeing tennis balls from the horror of the racket. You’ll have to write him about that yourself, H.M.; sorry. Right, back to the book. I liked it for several reasons. The first was the main character, Admiral John ‘Black Jack’ Geary. Why did I like him? That’s a bit of a complicated answer, Murdock. See, the story goes that Geary was a ship captain at the beginning of this galactic war between two factions: the Syndicate Worlds and the Alliance (he fought for the latter). In one battle, Geary’s ship was destroyed, and he ended up floating around the star system in a damaged escape pod. For the next one hundred years. After that interval, he was picked up by the crew of what later became his flagship in the ‘present’ Alliance fleet, the Dauntless. Now you’re getting it! It is a familiar plotline that we’ve heard from the legends of King Arthur on up. The more recent character he reminded me of was Captain America, who was discovered frozen in ice in suspended animation and thawed out to become the best superhero ever. Geary and he even have some similar traits (personally, I think Cap is better than him; but I’m biased; you might disagree). The second element of the story I like relates to a similarity with the early original Star Trek episodes. In the first eight episodes of Star Trek, Captain Kirk is in a relationship with his yeoman, Janice Rand. It’s the one BIG flaw in the whole story. Captains are NOT allowed to date officers or sailors below their rank, and she was at the bottom of the rank list. In Victorious, we find that Geary has fallen in love with the captain of the Dauntless, Tanya Desjani, throughout the events of the previous books. However, their own personal honor (as well as their respective ranks) prohibits them both from even saying “I love you.” Doesn’t matter whether they’re in private or not, neither of them can admit it as long as he’s her commander. Don’t look for that to change any time soon! The third element I liked was the aliens (or lack thereof). No, Murdock, wait – I haven’t even started yet! You’re welcome. Now, as I was saying, about the aliens. We never see them, only their ships, so no one has any idea what they truly look like. I guess it is a bit of a bummer but I’ve seen so many people’s idea of aliens that I don’t think there would be many ways he could do it that would surprise me. No, it wasn’t the fact that we don’t know what they look like that made me enjoy this element of the story. The reason I enjoy these aliens so much is that they’re not as smart as they think they are. Their tech is impressive; they designed and ‘leaked’ these inter-system gates (like the Stargate, at least from what I can gather) called hyper-net gates, to humanity. They also have these viruses that they downloaded into human computers (called quantum worms in the book) so that they can trace human military movements and befuddle human sensor arrays when the need arises. And their ships are only a little more maneuverable than human ships. The kicker is that in Victorious, humanity actually keeps up with these guys and finds a way around these technical advantages of the aliens: they make sure that the hyper-net gates can’t be detonated by the aliens, they find a way to eradicate the worms, and – well, read the book to find out how they deal with the aliens’ greater maneuverability. Oh, there’s one other thing about the aliens that I almost forgot to mention. Their command of English is terrible. Talk about refreshing! Aliens in sci-fi stories are traditionally more advanced than humanity and get English down pat right away (like the Vulcans or the Borg). Not this bunch! These guys aren’t that smart; they’re brilliant but not bright, if you get my drift. And that was a big selling point for me. Uh-oh, there’s the whistle. Time for me to go! This entry was posted in Book Reviews and tagged Aliens, Book Reviews, Jack Campbell, sci-fi novels, Science Fiction, sic-fi books, spaceships, The Lost Fleet: Victorious on May 5, 2013 by The Mithril Guardian.